Soon after 1 July 1960, when the Republic of the Congo became independent, Congolese soldiers mutinied and, with the aid of civilian mobs, raised havoc, attacking white settlers and plundering property. A United Nations task force sent to the Congo on 16 July brought stability. In March 1964, when plans for the withdrawal of the U.N. forces were announced for the end of June, tribal rivalries in outlying areas culminated in revolts against the government. 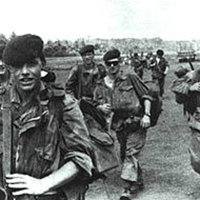 Early in November 1964, after the armed forces of the government were augmented by European and African mercenaries, they launched a two-pronged offensive against the so-called People's Republic of the Congo, which had received Communist support, particularly from China, and threatened the rebel capital of Stanleyville. The rebel president announced that he had taken 60 Americans and 800 Belgians as hostages to prevent further attacks. On 9 November, he broadcast that he could no longer guarantee the lives and property of American and Belgian citizens. Almost immediately, horror stories emanating from the area indicated the reality of the threat. The rebels killed Dr. Paul Carlson, an American medical missionary, wrongly claiming that he was a spy.